Goodrich Petroleum primarily operates in the ArkLaTex Basin of East Texas and Northern Louisiana. Goodrich entered the Eagle Ford to diversify its business and increase exposure to liquids-rich plays. The company entered through the acquisition of 35,000 net acres in August of 2010. The acreage deal included acreage in La Salle and Frio counties at a costs of $59 million ($1,650 per acre). Goodrich added more acreage through leasing and small acquisitions throughout the rest of the year and into 2011. The company now holds over 40,000 net acres in the Eagle Ford Shale and is expected to continue development drilling in both the Buda and Eagle Ford formations. Until 2010, Goodrich Petroleum Corporation (NYSE: GDP) was primarily engaged in the exploration, drilling, development and production of oil and natural gas primarily within the Cotton Valley trend and Haynesville Shale of East Texas and Northwest Louisiana. The company's assets are weighted toward natural gas and we expect the company will increase its drilling activity in the Haynesville Shale as natural gas prices warrant. On July 24, 2015, Goodrich entered into a definitive agreement to sell proved reserves and a portion of the associated leasehold in the Eagle Ford Shale for $118 million, subject to customary closing and post-closing adjustments. We will retain approximately fifty-eight percent, or approximately 17,000 net acres, of our undeveloped leasehold in the Eagle Ford Shale play for future development or sale. Goodrich drilled 3 (2 net) Eagle Ford wells in the first quarter. The wells, located in LaSalle County, Texas, were all drilled off the same pad, with an average lateral length of 8,750 feet and 33 planned frac stages per well. All three wells are scheduled to be fracked by the end of May. The company has also begun drilling operations on its Gemini 4H and 5H (estimated 66.7% WI) wells from a single pad. Both wells have a scheduled frac date in early June. Approximately $1.2 million, or 53% of the exploration expense for the quarter, was associated with leases in the far northwest corner of the company's Eagle Ford acreage position that were not extended or renewed. Goodrich anticipates a capex range between $90 – $110 million in the second quarter with approximately 85% allocated towards oil focused drilling and completion activities in the Tuscaloosa Marine Shale (TMS) and Eagle Ford Shale. During the quarter the company had production of 3,787 b/d of oil across its entire portfolio; however, company officials say production downtime in the Eagle Ford had an impact on Goodrich's total production tally. In the Eagle Ford Shale Trend, the Company conducted drilling operations on 13 gross (9 net) wells and added 7 gross (4.5 net) wells to production for the quarter. Since the end of the second quarter, the Company has averaged approximately 3,500 barrels of oil per day. Due to timing of completions, the Company expects to average 3,200 – 3,600 barrels of oil per day for the quarter, with 4 gross (3 net) wells added during July and 5 gross (3 net) wells added in September. The Company is currently running two operated rigs in the Eagle Ford Shale Trend. Goodrich also owns deep rights to approximately 10,000 net acres prospective for the Pearsall Shale on its Eagle Ford Shale Trend acreage, and it continues to monitor offset operator activity for potential future development. With its leasehold acquisition costs largely completed and rig count reduced in the Eagle Ford from three rigs to two rigs, the Company expects to spend approximately $115.0 million in the second half of the year, bringing the yearly capital expenditure estimate to approximately $250.0 million. For the quarter, the Company spent approximately $54.3 million, or 73% of its capital, in the Eagle Ford Shale Trend where we had 2 – 3 rigs running during the quarter, and $17.5 million, or 24%, in the Tuscaloosa Marine Shale Trend, for a total of $71.9 million, or 97%, of its total capital on oil-directed activity. Of the $17.5 million spent in the Tuscaloosa Marine Shale Trend, approximately $12.8 million was spent on leasehold, which was included in the Company's previously disclosed $27.5 million leasehold and infrastructure budget. For the quarter, the Company conducted drilling operations on 15 gross (10 net) wells, added 10 gross (5 net) wells to production and had 18 gross (9 net) wells waiting on completion at the end of the quarter. The Company added 7 gross (4.5 net) wells to production from the Eagle Ford Shale Trend, with 4 gross (3 net) wells waiting on completion. The Company expects its 2012 capital expenditures to be approximately $250.0 million, which includes an increase in the number of wells drilled and completed and capital allocated to the Tuscaloosa Marine Shale by approximately $20.0 million, offset by a reduction in capital expenditures of approximately $25.0 million previously allocated to the Angelina River Trend and Eagle Ford Shale Trend, with 5 gross (3 net) fewer Eagle Ford Shale Trend wells completed than previously estimated. Burns Ranch 30H (67% WI), a 5,060 foot lateral with 19 frac stages, at a 24-hour peak production rate of 500 boe/d. The Company has completed its Burns Ranch 15H (67% WI) well, a 9,200 foot lateral with 32 frac stages, at a 24-hour initial production rate of 1,250 barrels oil equivalent ("BOE") per day, comprised of 1,155 barrels of oil and 570 Mcf per day. The Burns Ranch 15H, which is the longest Eagle Ford Shale well drilled by the Company to date, has been online approximately 50 days and has averaged approximately 850 BOE (87% oil) per day. The Company has completed its Burns Ranch 17H (67% WI) well, a 4,700 foot lateral with 19 frac stages, at a 24-hour initial production rate of 1,155 BOE per day, comprised of 1,108 barrels of oil and 280 Mcf per day. The Company has completed its Burns Ranch 18H (67% WI) well, a 5,000 foot lateral with 19 frac stages, at a 24-hour initial production rate of 1,030 BOE per day, comprised of 955 barrels of oil and 450 Mcf per day. The Company has completed its third Buda Lime well, the Carnes 6H (67% WI) well, an unstimulated 3,100 foot lateral, at a 24-hour initial production rate of 1,635 BOE per day, comprised of 1,380 barrels of oil and 1,535 Mcf per day. The well averaged 1,000 BOE per day over the first thirty days, and had an estimated completed well cost of less than $3.0 million. The Company is currently flowing back its Burns Ranch 19H (67% WI) well, a 6,000 foot lateral, Burns Ranch 3H (67% WI), a 5,300 foot lateral, and Burns Ranch 20H (67% WI), a 5,900 foot lateral. The Company has drilled and is waiting on completion on its Burns Ranch 2H (67% WI), which has an 8,200 foot lateral, Burns Ranch 30H (67% WI), which has a 5,100 foot lateral and Burns Ranch 35H (67% WI), with a 9,400 foot lateral. The Company has two rigs running full time drilling Eagle Ford Shale and Buda Lime wells. 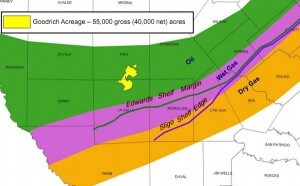 For the remainder of 2011, the Company currently anticipates drilling 5 gross (3.5 net) Eagle Ford Shale wells on the southern half and 8 gross (5.5 net) Buda Lime wells on the northern half of the Company's approximate 40,000 net acre block." The Company has completed its Burns Ranch 7H (67% WI) well, a 5,800 foot lateral with 21 frac stages, at a 24-hour initial production rate of 940 barrels oil equivalent (“BOE”) per day, comprised of 822 barrels of oil and 700 Mcf of natural gas per day. The Company has completed its Burns Ranch 9H (79% WI) well (previously released in an 8K), a 5,240 foot lateral with 19 frac stages, at a 24-hour initial production rate of 860 BOE per day, comprised of 820 barrels of oil and 245 Mcf of natural gas per day. The Company has completed its Burns Ranch 5H (67% WI) well, a 5,500 foot lateral with 20 frac stages, at a 24-hour initial production rate of 600 BOE per day, comprised of 570 barrels of oil and 200 Mcf of natural gas per day. The Company has completed its Pedro Morales 7H (79% WI) well on the northern portion of its block in Frio County, Texas. The well, which had an approximate 6,570 foot lateral and 18 frac stages, produced at a 24-hour initial production rate of 460 BOE per day on hydraulic pump, comprised of 400 barrels of oil and 325 Mcf of natural gas per day. The Company is in completion phase on the Burns Ranch 15H (67% WI) which has a 9,200 foot lateral, and the Burns Ranch 16H (67% WI), with a 5,700 foot lateral. The Company has commenced pad drilling on a portion of its block, with the Burns Ranch 19H (67% WI), Burns Ranch 20H (67% WI) and Burns Ranch 3H (67% WI) in drilling phase off of the same pad. In addition, the Company is currently drilling its Burns Ranch 17H (67% WI) well with a second rig.